Har Bracha  the Mount of Blessing  is a windswept hilltop settlement of Jews overlooking the Palestinian city of Nablus. According to biblical tradition, it is where Joshua and the children of Israel first entered the Holy Land. And, on Aug. 18, Mike Huckabee  a Baptist preacher, two-time governor of Arkansas and once and perhaps future Republican presidential candidate  received a heartfelt blessing from the local Orthodox Jewish minister. Rabbi Eliezer Melamed prayed that Huckabee would become President so that he could emulate the ancient Persian king Cyrus the Great, who encouraged the Jews to rebuild Solomon's Temple in Jerusalem. Said the rabbi: "We hope that under Mike Huckabee's presidency, he will be like Cyrus and push us to rebuild the temple and bring the final redemption." "You have imposed upon me a rather significant role," Huckabee replied. "[To] train the Jewish people to love Israel. You're going to ask a Baptist to do that?" But speaking to TIME, he uttered words that would warm the hearts of Jewish settlers. "Do the Palestinians need a place to call their own?" he asked rhetorically. "If that's very important, then that should be accommodated. But can it be accommodated on the exact same property that Jews currently occupy? The answer is no, it can't. And so we can kid ourselves all day long and try to perpetuate this idea of having two governments running the same country, but it's not worked out and it's not realistic." The three-day visit is Huckabee's 11th trip to Israel. The Arkansan, who is widely expected to seek the presidency again, in 2012, visited sites heavily weighted toward one side in the Middle East conflict: Israeli homes in predominantly Arab neighborhoods of East Jerusalem and Israeli settlements on the West Bank, including an outpost considered illegal even by the current Israeli government. He explored underground tunnels in the ancient city of King David, which are slowly being excavated from underneath the Palestinian village of Silwan in East Jerusalem; he also visited the place where Jacob dreamed of a ladder leading up to heaven, in the West Bank settlement of Beth-El, next to an Israeli military base on the outskirts of the Palestinian city of Ramallah. "It's inconceivable that we would ever understand how two sovereign governments would control the very same piece of real estate. We don't know how that would work," Huckabee said, elaborating on his opposition to the two-state solution. He compared the ban on Israeli settlements in Arab areas of East Jerusalem and the West Bank to segregation between black and white Americans in the deep South during his childhood. He called for "integration" between Israelis and Arabs. The Obama Administration has been at odds with the government of Israeli Prime Minister Benjamin Netanyahu over settlement activity in East Jerusalem and the West Bank, and Huckabee has used his trip to accuse Obama of zigzagging on pledges he made to Israel during the 2008 campaign. "Our primary concern ought to be whether or not Iran is weaponizing nuclear material, not whether 20 peaceful Jewish families happen to be moving into a neighborhood in their own country," he said. Huckabee was in Israel as a guest of the Jewish Reclamation Project of Ateret Cohanim, an Israeli educational foundation that aims to strengthen the Israeli presence in occupied East Jerusalem through the purchase of property for study centers and the families of students and teachers. Against bitter opposition from Palestinian groups and left-wing Israeli organizations, Ateret Cohanim has established yeshiva study institutes in the Muslim and Christian quarters of Jerusalem's Old City and encouraged housing projects for nearly 1,000 Jews in Arab neighborhoods where Jewish residents were forced to leave more than 60 years ago because of wars and unrest. The group boasts of its activities in "hot areas" of East Jerusalem. Its plans to develop 20 new Israeli homes were denounced last month by the Obama Administration. Huckabee told TIME that he purchased his own air ticket and was not a member of Ateret Cohanim. "I have no personal connection," he said. "I don't think they would let me in since I'm not Jewish." Joseph D. Frager, a New York physician who is chairman of the Jerusalem Reclamation Project and on the board of Ateret Cohanim, said he organized the trip because he believes Huckabee "understands the Middle East probably better than most political leaders in America." Frager told TIME, "I compare Huckabee to Winston Churchill a lot, because Churchill was a fundamentalist Christian, [which] very [few] people realize. Huckabee has the same type of fundamentalist Christian background that enables him to understand the dynamics of the state of Israel, Judea and Samaria in particular, and of course, Jerusalem. Mike Huckabee represents the majority of Americans, fundamentalist Christians or not. The majority of Americans' views are a lot more closely aligned with Governor Huckabee than they are with President Obama." But perhaps not with the views of all Israelis. Peace Now leader Yariv Oppenheimer was among several dozen protesters who greeted Huckabee on Aug. 17. "It's very easy to live in America and tell us to keep fighting the Palestinians," Oppenheimer told TIME. "We deeply believe that the two-state solution is an Israeli interest, and before someone from abroad comes to speak to us about taking over land and neglecting peace, he should remember that he is not the one who will have to fight in the army, stand at the checkpoints and continue to fight wars because there is no vision for peace in this country." 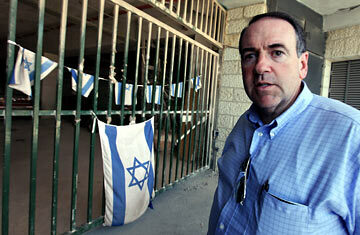 Huckabee was certainly unwelcome in the eyes of Palestinians. Dimitri Diliani, a newly elected member of the Fatah Revolutionary Council, said the former governor was "stupid" and "un-American." "He is damaging to the official U.S. policy regarding illegal settlement activities in the West Bank, including East Jerusalem," Diliani told TIME. "He represents a petty politician looking for petty support from the American right, whose heydays are far behind us. Settlement activity is criminal in nature. In being the icing on the cake in the eyes of the fanatics in the Israeli settlement movement, he is an example of how low a politician will go to get an audience." See pictures of Chuck Norris endorsing Huckabee. See pictures of polarizing politicians on LIFE.com.